Even as an adult, I’m still in awe every time I see a rainbow in the sky. How do they form and why don’t we see them everyday? Many of us are aware that the symbol of a rainbow represents the LBGTQ community, which in my opinion, seems so fitting. However, when I see a rainbow, I like to think it’s a symbol for “at the moment, everything is right in my life.” I hesitate to mention this because I’m pretty sure that feeling was not what the LBGTQ community had in mind when they chose the rainbow to represent themselves. Nevertheless, I think many will agree that the rainbow is a positive symbol and I hope that it’s not offensive to feel the way I do every time I see one. I have been searching online for a particular rainbow shirt because my recent affinity for rainbows has given me a retro feeling. I remember when my cousin Jay-Jay and I were young - 7 or 8 years old - rainbow shirts were the rage. 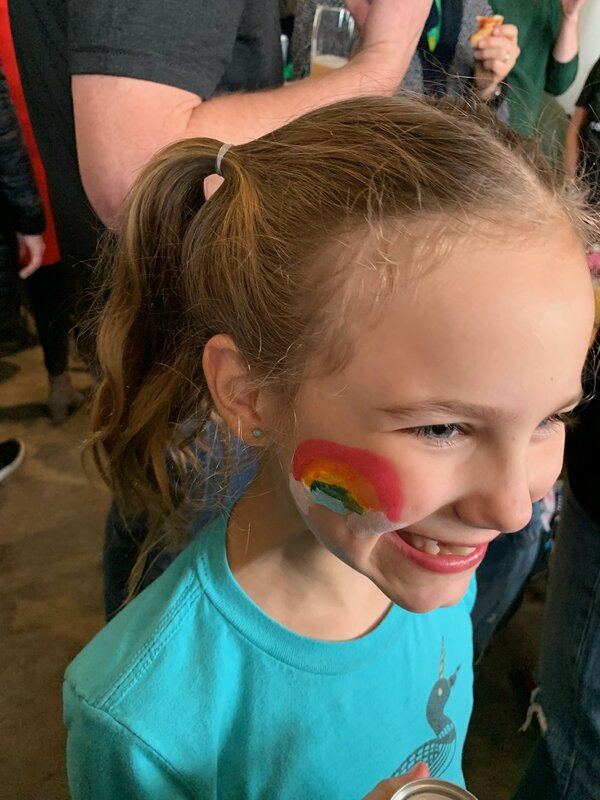 She got a rainbow shirt and I wanted one too. I knew my mom felt the pressure to get one for me but at the time, those shirts were trendy which meant that they were expensive. My mom refused to spend much on clothes so I think it was years before I finally got a rainbow shirt. Of course, the fad had long faded by then. The reason rainbows have resurfaced as one of my favorite symbols these days is because I was recently moved by one. Last October, I was stressed out one evening when I was helping a family in need. A former teacher for both of my kids was caring for her terminally ill husband and two young boys. I signed up to bring them a home cooked meal and at the time, my calendar wasn’t full. As the meal due date approached, my schedule got totally crazy. Well, I think I should admit that I forgot to allot time not only for preparing the meal, but for delivering it too. I also needed to be somewhere else at the exact time. Typical. The reason I was sweating bullets to get this meal to them asap is because I remembered when my kids were two and four years old we HAD to eat at 530p or else all hell would break loose! I was able to deliver the meal on time and was racing to the next activity when I looked up at the sky and saw an amazing rainbow. Instantly, I felt like it was a warm hug. Like someone was trying to say, “At this very moment, everything is right in your life.” I actually thanked the rainbow for appearing because I needed that reminder, that hug. Simultaneously, I also felt like the rainbow was a thank you gift - it was a reward for my help. This is a stack of 85 cards by E. Frances Little Notes. I love how there is space to write a note on the back. The actual size is comparable to a business card. Believe it or not, I have to order another box - St. Patrick’s Day wiped out my supply! Not only did we use the rainbow cards for the non-St. Patrick’s Day themed lottery tickets, but we used them for my son’s classmates. I found chocolate gold coin replicas. We gave each classmate a pinch with a card that said, “Here’s your pot of gold at the end of this rain-Beau. You may notice that I did find some “Lots O’ Luck” lottery tickets. Each of those cost $3 which is above my $1/per pinch budget so I only bought a few of them. 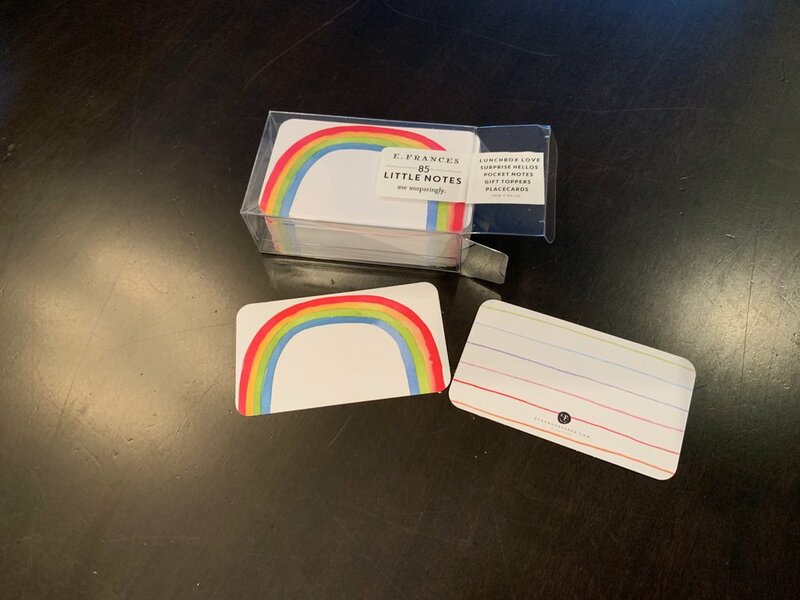 Another rainbow pinch idea is to fill this wallet up with some gift cards. For example, a $5 Starbucks card and a $10 Target card. The dollar amount for each venue is not important but it gives the recipient the idea of using it for the many gift cards they may accumulate. Again, “pot o’ gold at the end of the rainbow” would work well for this theme. It’s a pinch that would be loved for any occasion, not just for St. Patty’s Day. 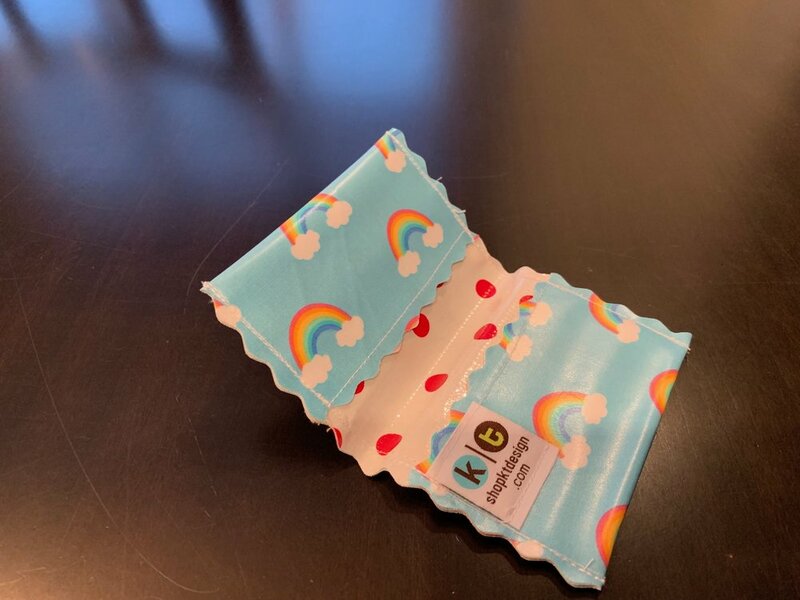 KT Design makes these wallets. You can use them for gifts cards or when you want to just carry your driver’s license, a $20 bill and/or a single credit card while you’re out for a GNO or date night. Maybe rainbows keep popping up all around me because there is a lot that is right in my life these days. I came across my Kate Spades when I was figuring out what to pack for our Spring Break trip. Although these shoes are almost a decade old, they are timeless and classic. The shoes reminded me that everything was not right in Kate Spade’s life so in her honor (and because I’m giddy about rainbows these days), I will wear these on vacation for sure! These shoes are comfortable, they add color to any drab outfit and they give me height. Thank you Kate Spade, you are missed! Even though these Kate Spade shoes are not the ROYBGIV colors -they’re still rainbows to me! 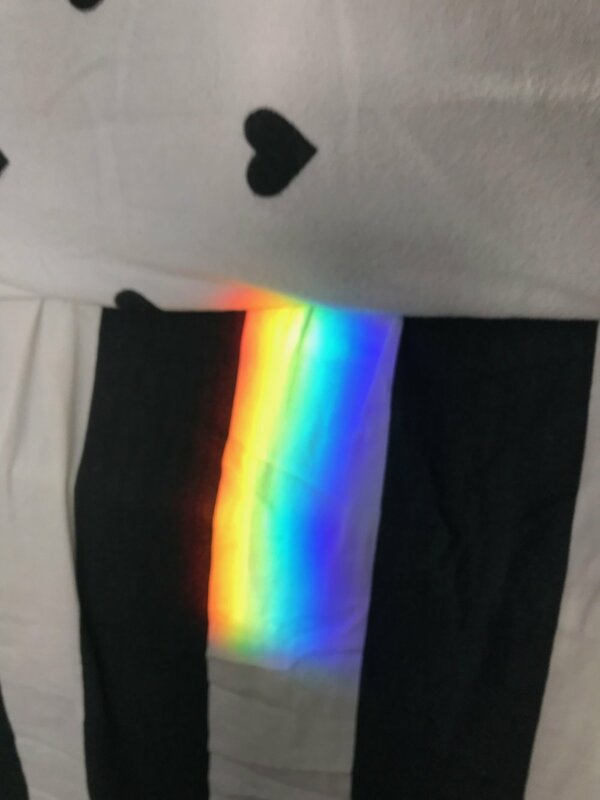 Just this morning, my daughter took a picture of this rainbow. She found it on the bedding in her room. I love how the vivid colors brighten the day. If I could, I would change my name to Bow, short for Rainbow - like the character on the show Blackish. But in our house, that would be one too many Bow/Beau(s). Besides, rainbows are about peace and serenity according to Sunsigns.org and that name doesn’t fit me at all. Fine, I won’t change my name. Instead, I will buy that retro rainbow shirt and wear my rainbow shoes. At this moment, everything is right in my life.